With offices in Cape Town, Durban, Johannesburg and Port Elizabeth,Toll Global Forwarding is able to provide international freight services by air, ocean and road, and customised supply chain solutions to customers from various sectors.Toll Global Forwarding, part of Toll Group, operates through a worldwide network of owned and affiliate operations across more than 150 countries. Our specialist airfreight teams are equipped to offer a fast, reliable and cost effective service. Our global network providesa complete range of sea freight services to meet any import and export requirements. When ocean is too slow but air too costly, our Sea-Air solution combines the advantages of economy and speed. We offer a complete range of customs brokerage services including border control formalities. We can provide secure and safe storage for everything from retail, refrigerated or fragile items, to high-risk and hazardous materials and high-security items. 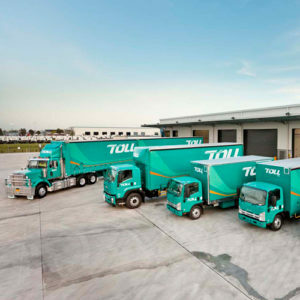 Toll Global Forwarding specialise in integrating services to providea single offering to our clients, providing a seamless execution from placement of international purchase order through to delivery to store/site/point of consumption. Specialised logistics solutions ona project basis, from feasibility studies and export quality inspections to supply chain consultancy and optimisation.